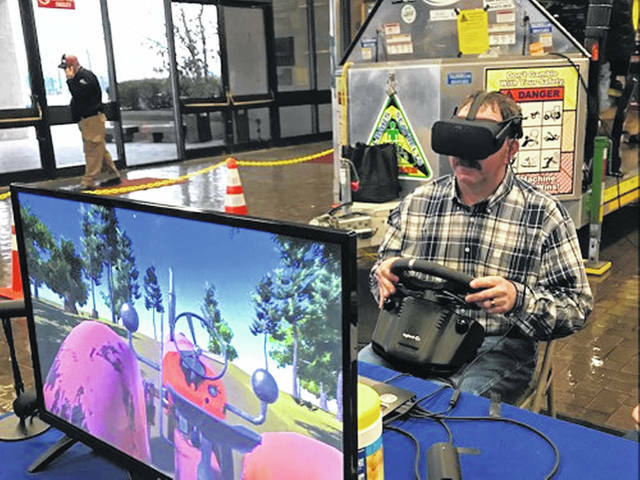 An exhibit at the Farm Science Review will use virtual reality to demonstrate commercial and industrial fall protection systems and practices. LONDON – Agricultural safety professionals with the College of Food, Agricultural, and Environmental Sciences at The Ohio State University (CFAES) will use virtual reality to educate and prepare farmers to be safe on the farm, during a demonstration and exhibit offered at the annual Farm Science Review, Sept. 18-20. The exhibit will use virtual reality to demonstrate commercial and industrial fall protection systems and practices. The 3- to 5-minute experience will offer Review attendees a simulated experience on the roof of a two-story building where they can locate common fall hazards and select proper fall protection equipment. Studies show that the closer a safety training program can replicate reality, the more those trainings will stick, organizers said. https://www.urbanacitizen.com/wp-content/uploads/sites/36/2018/09/web1_fsr_virtual_reality_1.jpgAn exhibit at the Farm Science Review will use virtual reality to demonstrate commercial and industrial fall protection systems and practices.